Komputer Kraft Consulting is dedicated to providing you with market leading software solutions, specifically designed for your business requirements. With more than 55,000 customer sites worldwide, BMC is a global leader in delivering practical, flexible solutions that allow IT organisations to improve service to their end-users. BMC is a stable, well-established company with a long history of consistent growth and delivering a high level of service to its customers. BMC’s integrated IT service and asset management software platforms enable organisations to efficiently automate a wide variety of IT related tasks and processes using interoperable solutions from a single, proven vendor. Our focus is on assisting our clients in building organization’s capability and readiness for the Service Management. 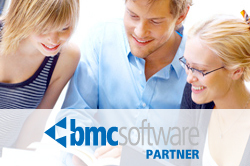 Widely known for dedicated focus on ease of use and affordability, BMC business solutions with our assistance makes your goals even easier to execute by reducing complexity for IT Service Management and Process automation, IT Asset Management, Mobile Device Management, Inventory and Desktop Management, Workload Automation. KKC provides consulting services with a focus on the long term business goal outcomes. Our success is based on our long term strategy of delivering value to our clients. We Put Customers First. We are passionate about facilitating, through our product and service offerings, an optimal way for our customers to effectively manage their IT environments with practical and flexible solutions. Act with Respect and Integrity. In all our actions and words, we demonstrate care and respect for our customers, our partners and each other. We maintain the highest levels of integrity by being forthright and building trust based on keeping our commitments to others. Empower and Be Accountable. We are all leaders, and it is the responsibility of leaders at all levels to respect and empower those around them. Empowered leaders commit to the team what they will deliver and are accountable for the results. Team to Win. We know that none of us works as smart as all of us. Teams based on mutual respect and trust build on each other’s diverse perspectives and experiences to drive better answers and higher levels of success. Grow Profitably. To achieve our mission for our customers, ourselves and our investors, we commit to delivering results that provide steady profits and enable investment for growth.